Which is the best 8-inch tablet you can buy right now? I’m reviewing all tablets with Windows, Android, and iPads. And here are my best recommendations. Which are the best 8-inch tablets? There is a lot to choose from and it can be hard to get a good and up-to-date overview. I’ve been reviewing tablets for over 10 years and 8-inch ones are my favorites. They’re very versatile and easy to carry with you. Read on to get to know the best 8-inch tablets available right now. Below you’ll always find a link to the reviews of the tablets listed here. If you want to get to know the tablet better, you should click through and read about all the positives and negatives in more detail. In addition to those, you can see all of my tablet reviews here. Alright, here are the best 8-inch tablets available right now. The Huawei MediaPad M5 8 is the best 8-inch tablet you can get right now. It offers a very high-resolution 8.4-inch screen with 2560 x 1600 pixels and a very powerful HiSilicon Kirin 960 octa-core processor. That one is supported by 4GB of RAM and a 32GB to 128GB internal storage. Because of this hardware, the MediaPad M5 8 is the fastest 8-inch tablet on the market. I like that we are getting a lot of premium features with this device. Among those are two good speakers and a fingerprint scanner. The build quality is very high-end too and we’re getting up-to-date software with Android 8 Oreo. During my review, I could find very few negative points only. The biggest one is the missing headphone jack. Yes, there is none. If you don’t have Bluetooth or USB C headphones, you have to use an adapter. That adapter is included though. Besides that, I think the MediaPad M5 8 is great. And often it is quite affordable and costs below 350 US Dollars. The next best tablet is called Chuwi Hi9 Pro. While it is noticeably weaker, it also is much cheaper with a price tag of around 150 US Dollars. However, most of the time, you won’t be able to get it at your local retailer. Instead, you probably have to import it from China. Usually, that is very easy though. Even though the Hi9 Pro is so affordable, we actually do get a pretty 8.4-inch screen that has the same resolution of 2560 x 1600 as the MediaPad M5 8 does. In fact, we get a mostly metal body as well and it does feel high-end. As you might expect, the performance is much weaker though. While it is good enough for most apps and even most games, you won’t be able to play games like PUBG Mobile with HD settings. Again, as is common with cheaper tablets, pretty much all premium features are missing. There is no fingerprint scanner and the battery life is short. On the bright side, we do get LTE and a dual-SIM slot out of the box. It is running Android 8 Oreo. The Amazon Fire HD 8 2018 is the weakest tablet on this list but also the cheapest one. With a price of just 79.99 US Dollars, it is very inexpensive. I think it is a great value but keep in mind that we don’t get the best screens and the performance is not good enough for high-end gaming. 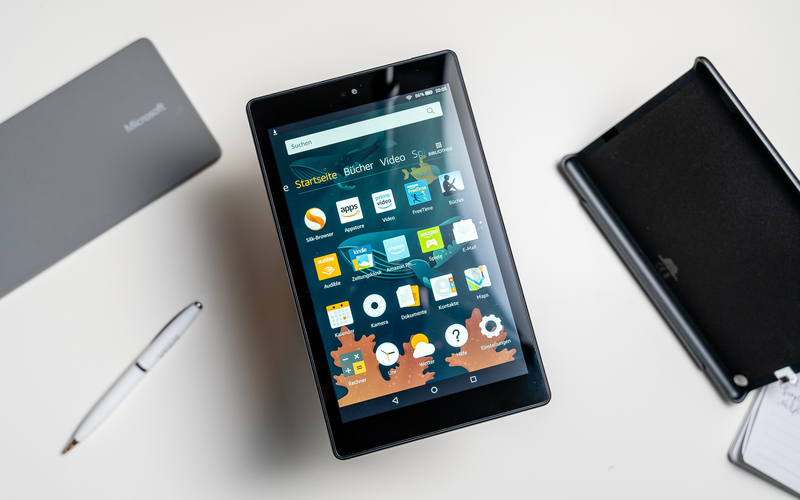 With the Fire HD 8, we get an 8-inch HD screen and a Quad-Core processor. I like that it supports Alexa out of the box. If you want, you can even get it with a Show Mode Charging Dock. With that one, you can kind of transform the tablet into an Echo Show. Because of its low price, I think the value is good. However, there are no premium features and we get a full plastic body only. And, out of the box, there is no Google Play Store pre-installed. If you want to use Google apps, you have to install it yourself. That is easy but might void your warranty. What about the Apple iPad Mini? I can’t recommend any iPad Mini right now because it has been years since Apple updated it. Don’t worry though. According to several rumors, they are going to announce a new iPad Mini in 2019. Once that happens, I’ll update this list. What about 8-inch Windows tablets? While there have been some very interesting 8-inch Windows tablets in the past, there is none I can recommend right now. The only ones still in production have to be imported from China directly and do not feature up-to-date hardware. However, if you can live with bigger screens, you can check out my Windows tablet recommendations here. I will be very glad to Your response to my email. mail. Sincerely, Slavinskaya Anna.